Here you will find our “I Can” Checklists written by The Curriculum Corner. 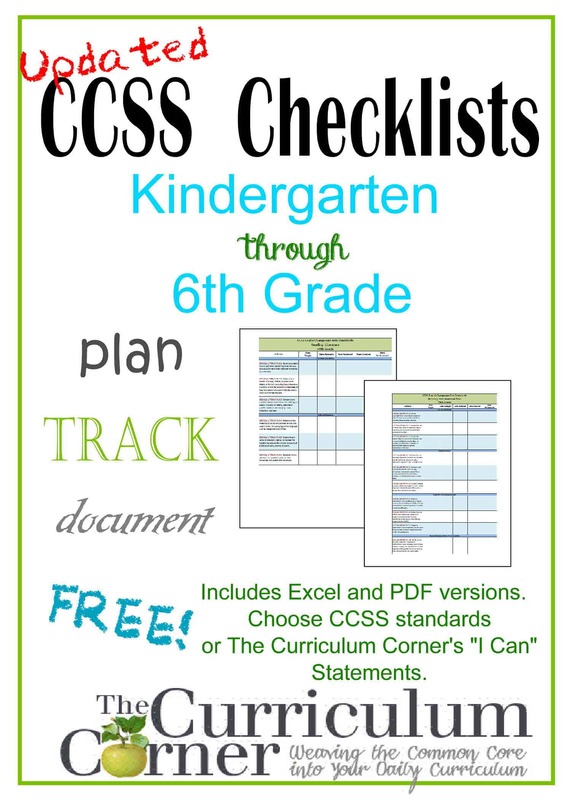 Here we have pulled together all of our CCSS Checklists in one easy-to-find spot! Our common core standards checklists are just what you need to help you keep track of the standards taught in your classroom. Use these to make sure you are addressing all that you need to teach throughout the course of the school year. Keep track of when you have introduced, retaught and assessed each indicator. The most important parts of the common core are the anchor standards that carry through from kindergarten to high school. These have been included with each language arts checklist so that you don’t lose sight of your essential goals for teaching and learning. ***Please keep in mind that these checklists are more to be used as a system of checks and balances in your teaching for the year and not so much a “check off” sheet for these indicators to be checked and thought of as “done”. You will be teaching so many of these concepts during your small groups and one-on-one conferencing each and every day. You have your choice of an editable Excel spreadsheet to type your dates and/or notes in the boxes OR you can simply print the PDF and write in the boxes. Because we have had so many teachers copying our working and selling it on Teachers Pay Teachers, we have had to lock the cells so that our I Can Statements cannot be copied. Our intent is for our resources to always be free – not copied and sold. **Note – you may have to play around with your margins to get them to print just the way you want them. The first two resources fpr each grade level are the more in depth explanatory standards provided on www.corestandards.org. You may want to print them and keep them in the front of a data binder for reference. The first set of checklists have been created using the CCSS as they are found on www.corestandards.org and a second resource has been created using the I Can statements we created. Choose whichever suits your needs the best!